LANCASTER – The Antelope Valley Transit Authority (AVTA) recently added a new stop on the 786 Commuter Route, which now services the West Los Angeles Veterans Administration Medical Center. 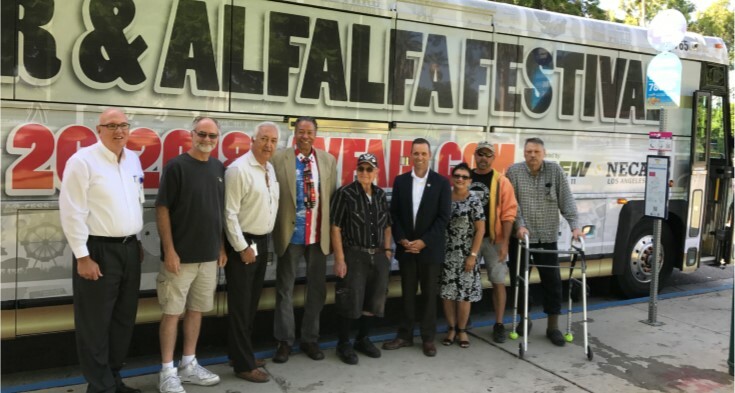 To celebrate the new service, Congressman Steve Knight (R-Palmdale) joined representatives from various branches of the armed forces Wednesday morning on a bus trip to the VA facility, located at 11301 Wilshire Blvd. “Ensuring that our local heroes receive the medical treatment they need from the VA is a passion of mine,” Knight stated. “This new service being offered by AVTA will allow many veterans to travel to the West LA Medical Center for treatment without having to worry about finding a ride”. Knight and the veterans, along with regular commuter passengers on their way down to Los Angeles, enjoyed free Wi-Fi on AVTA’s air-conditioned 45-foot bus. The agency operates a fleet of 30 commuter buses, making daily trips from Lancaster and Palmdale down to Los Angeles, Century City and the San Fernando Valley. With the Antelope Valley’s large veteran and active duty military population, the connection to the largest veteran facility in the VA health care system provides a much-needed transportation solution. For fares, routes and schedule information, visit www.avta.com. 11 comments for "Congressman Steve Knight joins local veterans on bus ride to VA Medical Center"
Well, It is a positive for the veterans, and I would think that is what matters. Agreed. Some congressman coming from Washington to grab some publicity definitely isn’t what matters. Certainly couldn’t tell that by looking at his performance. All politicians seek publicity through photo-ops, yes, all, even the beloved Mayor of Palmdale. No matter what you or anyone else thinks of him, he supports veterans, and Mayor Ledford supports him. If you or anyone else wants a change, than you have the choice to vote or not vote for Steve Knight. I am not defending him, I am stating the facts about this particular article, and that Mayor Ledford supports him. If you aren’t defending him, what exactly are you trying to do? The guy has been a “true Republican.” When the GOP wants to punish California for being “too liberal,” which translates to “providing funding and other support to the Democratic party,” they have never not been able to count on Steve Knight, because he will ALWAYS put party loyalty ahead of his district. What it was is a handout to a medical equipment company that paid off the GOP. They made a piece of “advanced treatment equipment” for traumatic brain injuries. “Advanced treatment” is code for “not yet proven to work.” Being unproven, the very expensive equipment wasn’t selling, but good old Steve and the GOP provided money for the VA…as long as it was spent buying this equipment from their patron. So, the manufacturer not only got sales, they got a free testing and demonstration program for their equipment. Since it turns out to have provided an effective, or at the very least harmless, treatment the equipment is now being purchased by hospitals and the company is making great profits, which they are sharing with the GOP. If the experiment had gone badly do you think the GOP would have cried for any wounded veterans who came to harm? Or would they have just sent errand boy Knight out to ride a bus? Tim, I read this article, and I thought having a bus to take veterans to the VA Medical Center is a good thing. That was my original comment. You took my very simple comment and turned it into this looooong drawn out missive about all things Steve Knight (Republican), that have nothing to with my original comment. No Tim, I am not defending him, I am defending this particular action, which is having a bus take veterans to the VA Medical Center. In fact I did NOT even mention Steve Knight! This is why I can’t stand the hateful dialogue that is now going on with Democrats and Republicans, even going so far as to wish death on others. Continue on, Tim, and find someone else to fight with. Alexis, if the article had been about the bus I would have had nothing to say other than agreeing with your comment. If you look, you will see that the first word in my reply was “Agreed.” However, the reality is that the article was just as much, if not more, about Steve Knight. You left that aspect unremarked, which is your right. Soon to be “Former Congressman” Steve Knight after Katie Hill beats him in November. Let us hope, and each do our best to make sure that happens. I hope they’re not using those electric busses that keep breaking down. Paul Ryan must have told him he had to do it.